Recycling in the workplace has many benefits – Recycling costs less than sending waste to landfill and it also generates cash as many companies will buy your recycling from you. More and more people are becoming concerned with the welfare of the planet and may choose you over a competitor if you promote that you actively recycle as much as possible. I Already Know How To Recycle But What About Reducing Waste? We all know that, whether you’re running a business for profit or a charitable business, money matters. Any wasted money can be detrimental to the success of your business. What we don’t always see is that wasted food is wasted money. To put things into perspective, it helps to apply a cost to waste. This demonstrates the true value of waste. As a food service business, it is likely that most of your waste is food waste, so it makes sense to devote your attention here to start. 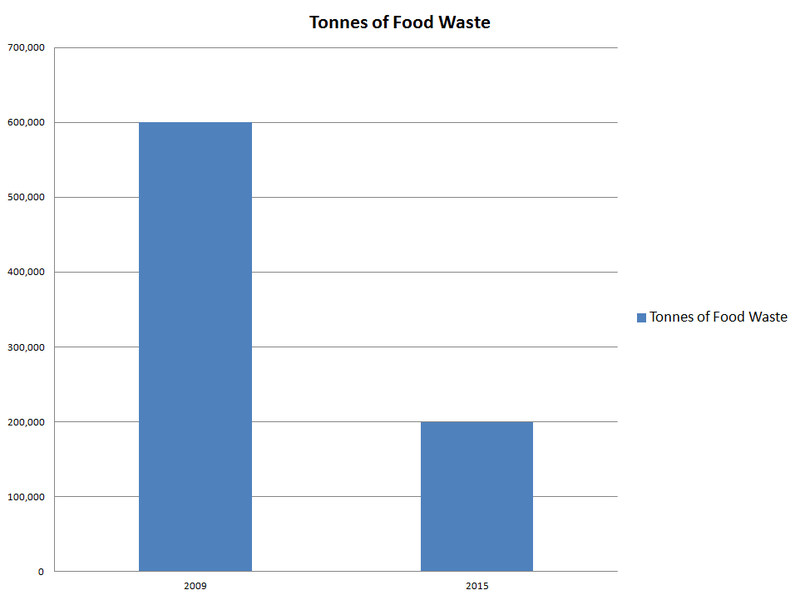 The average avoidable cost in food waste per meal in the UK is £0.97. This doesn’t sound a lot but it soon adds up. Each year, restaurants in the UK produce around 199,100 tonnes of food waste and each tonne represents around £3,500 of wasted money. Just think how heavy your bins are when you empty them and how much money you could be adding to your profits if you reduced your waste. Research by WRAP in 2009 found UK hotels, pubs, restaurants and quick service restaurants disposed of 600,000 tonnes of food waste. So we are moving in the right direction, but there is still room to be better. Even with these drastic reduction in waste - For every hungry person in the world,1.27 tonnes of food is wasted every year worldwide. To properly understand where you can reduce food waste, you first have to know where the waste is coming from. Figuring this out does take time but the rewards are worth it. Just follow these simple steps and you’ll be well on your way to boosting your profits. This first step will highlight where your waste is coming from and roughly how much it’s costing you. For this, you’ll have to completely separate your food waste from other waste; this can be done by making sure that everywhere someone is likely to dispose of food there are dedicated food waste bins. Make sure you have at least three bins for food waste. One for food prep waste, one for spoiled food and one for scraps left on your customers plates. Every time one of these bins is emptied it should be weighed and the weight recorded. After a week, you’ll have a pretty good idea of what percentage of waste is coming from where. With this information, you can work out the rough cost of your food waste. Just multiply the weight of your waste in kilos by 3.5 to get the cost in pounds. Use your plate waste information when planning your menu. If you find that all your Sunday dinners are returned with no food on the plate but still half a jug of gravy then that’s a strong indicator that you are giving too much. A common problem is that it’s tempting to fill a jug until it’s nearly full as that’s what looks best, but in reality no one person is going to consume that much gravy. If you don’t want to serve a half full gravy jug, then why not serve gravy to share? Or even offer free refills so it’s clear you’re not trying to con customers but reduce waste. It might seem small but it’s a good place to start. Do this with all foods that are returned to the kitchen and you’ll soon be reaping the benefits. Unilever Food Solutions carried out a study in 2011 that revealed that 82% of the UK public said they are concerned with the amount of food that is thrown away every day in restaurants and canteens. Strattons: a small, independent, family-run hotel in Norfolk. In just one year (2010-11), the hotel managed to save over £16,000. Through a series of innovative measures, Spirit Pub Company has saved over £1.6 million which was some 65% of their total waste costs. A consumer survey carried out by WRAP found that 41% of consumers blamed oversize portions for leaving food - Chips accounted for 32% of food left on plates - The most popular response was that people would like to see more choice when it comes to portion sizes It’s easy to worry about how customers will react to a change in portion size, but as long as the changes aren’t too drastic you have nothing to worry about. It’s also not a bad idea to explain what you are doing to your customers (your local press might even want to hear about how much waste you have diverted from the landfill; everyone likes a little free advertising). Food spoilage is usually the smallest contributor to food waste. There is often a feeling of guilt when throwing food away because it’s passed its best. Spoilage happens for many reasons, some unavoidable, but generally it can be reduced to next to nothing. Let’s take a look at the main reasons why food spoils. We all know the importance of temperatures in food prep and the recommended temperatures are ingrained in the brain of anyone who prepares food, but these temperatures are very broad. Take fish for example. There is nothing wrong with storing it in a fridge and keeping it at 4°C or less, although if you have a fridge that is capable, it is far better to store fish at lower temperatures. Even better still, you can freeze the fish. If, as a restaurant, you get your fish in that day and sell it the same day, you have nothing to worry about. If you are buying in fish to be consumed over the next few days and often have to dispose of it, then reviewing how it’s stored could be the difference between selling out and throwing out. By repeating this and questioning if your food is stored at the best temperature then you should be able to make food last longer and waste less. The kitchen can easily end up with too much of one type of food. This could be down to a last minute cancellation from a party, or even just a couple of tables not turning up, which can cause extra food to be left at the end of the night. Nightly stock takes before placing orders for more produce will iron most of this out, and last minute menu adjustments to use up food before it begins to spoil will usually use up any food way before you need to throw it out. Sometimes, just putting a dish on the menu isn’t enough, and this is where your front of house staff play a vital role. Try instigating a little healthy competition; maybe offer a drink to the person that has sold the most of that dish by the end of the shift. More often than not, giving away a drink will cost you far less than throwing food out. It also helps to build a strong team when competitions are introduced. Another way to reduce food spoilage is to use a FIFO or first in, first out system. If you’re not familiar with this term, then you can take a look at our guide on correct food storage and stock rotation procedures for restaurants. Food prep waste is something that’s personal to each restaurant, yet can be one of the easiest to reduce. It involves working closely with your team to identify what waste from food prep can be avoided. The process does take a little innovation and creative thinking. Maybe you could turn your leftover veg cuttings into a tasty purée that complements a dish you already serve. By looking at prep waste in this way, you could even improve the perceived quality of the food you serve. All in all, if we could see the cost of waste more clearly, we would all work harder to reduce waste. As we can’t see the cost easily, we have to put in the extra work to make sure money isn’t being thrown in the bin. To make separation of foods easier, Rubbermaid have created a trolley system for their Slim Jim Bins that allow you to move multiple bins with ease.